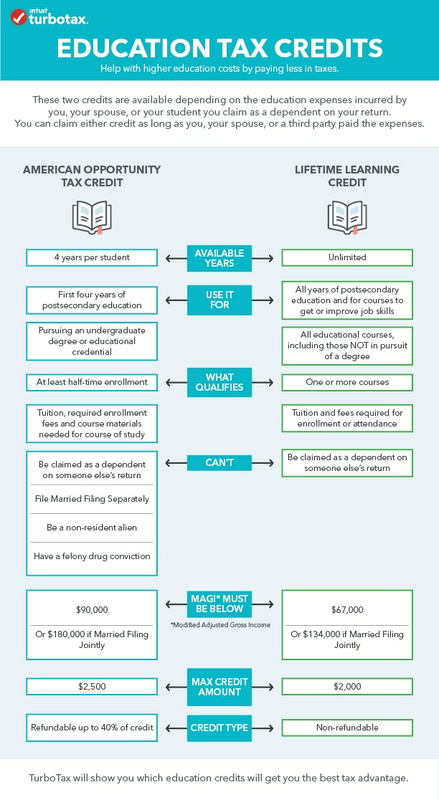 Education tax credits can help you with higher education costs by reducing the amount of tax you owe. There are two credits available, the American Opportunity Tax Credit and the Lifetime Learning Credit. We check both of them for you. You can use this credit for the first four years of college when working towards a degree. Maximum credit is $2,500 per eligible student. Must be enrolled at least half time for at least one semester during the tax year. Up to $1,000 can be refunded to you. There is no limit on the number of years you can use this credit for undergraduate, graduate and professional degree courses, including ones to improve job skills. Maximum credit is $2,000 per tax return. Can be used when you're only taking one class. You don't need to be working towards a degree. None of the credit is refundable.